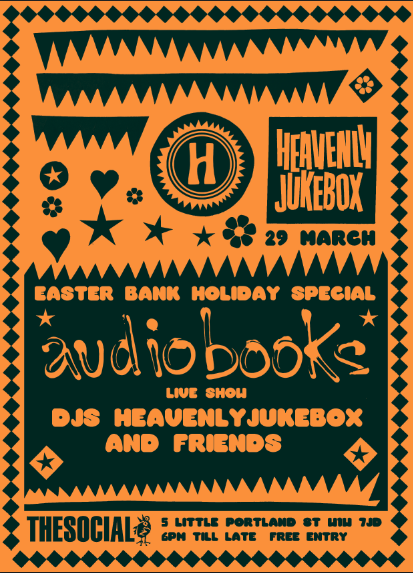 Very happy to announce that the full Heavenly Jukebox crew and friends will be out on Good Thursday for a big bank holiday blowout. And we’re even happier to officially announce a new addition to the Heavenly Recordings family. audiobooks ride the sharp neon ley-lines that run between the north Wales coast and the grubby heart of after hours London. These songs are Pulp fictions by an inhuman league. They’re our new favourite band. Start following the story now. There’s no music online for these guys . . for the time being you’ll just have to get down to this show to see what everyone’s talking about!